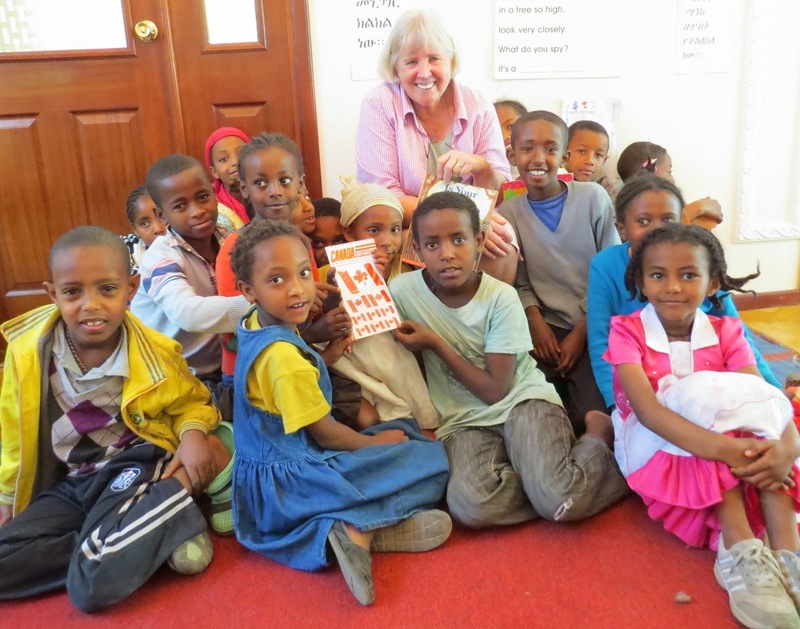 Many years ago, my friend and colleague Jane Kurtz, a children’s author from the US who was born in Ethiopia, was part of a group of both Americans and Ethiopians wanting to put books in the hands of children here. 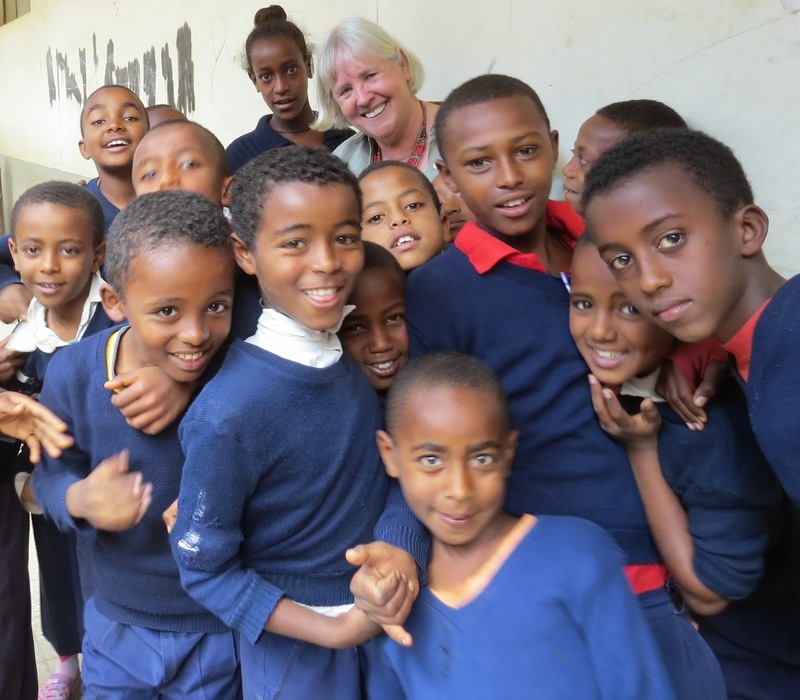 They were instrumental in starting up a library program to help bring literacy and a love of reading to children in Ethiopia. 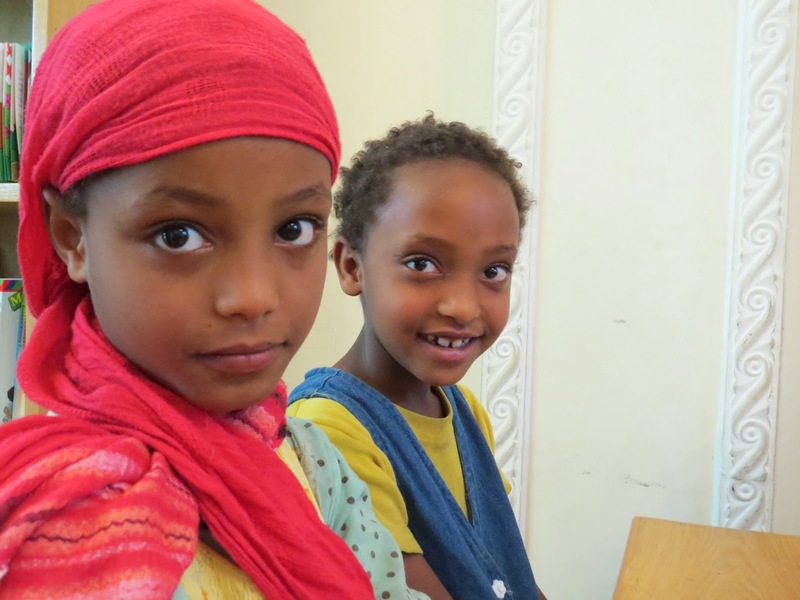 Their vision blossomed into a solid organization: Ethiopia Reads. 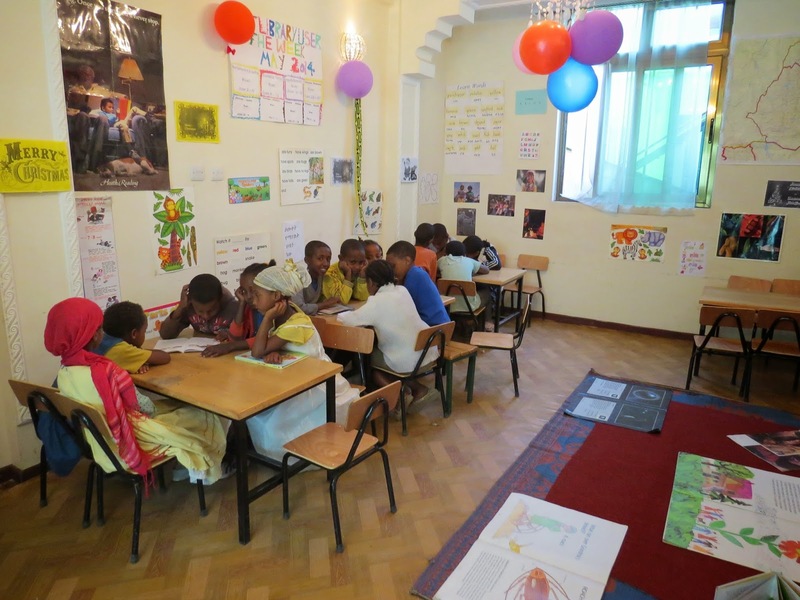 With an administrative and fundraising headquarters in Minnesota and a local office in Addis Ababa, the program now runs some 65 libraries across Ethiopia. Their mission statement says ‘Ethiopia Reads collaborates with Ethiopian communities to build schools, plant libraries, teach teachers, boost literacy and provide youth and families with the tools to improve their lives’. 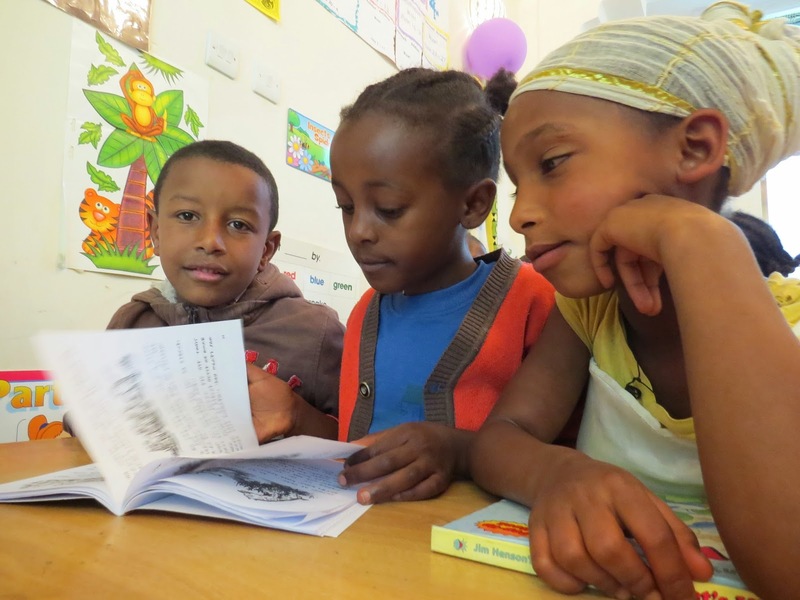 Ethiopia Reads’ projects include starting and running libraries at local schools that did not previously have books. The school has to make available a space suitable for a library. ER than supplies books and a librarian and helps to foster a love of reading in local children and their families. They help to train teachers to be librarians and organize programs such as story time. A few of the libraries are community libraries, open to anyone who wants to come and read. Often the children, and adults, don’t actually borrow the books, but come in to read and to listen to stories. In the countryside, some of the libraries are not located in buildings. These unique, horse powered mobile libraries deliver books to remote villages. 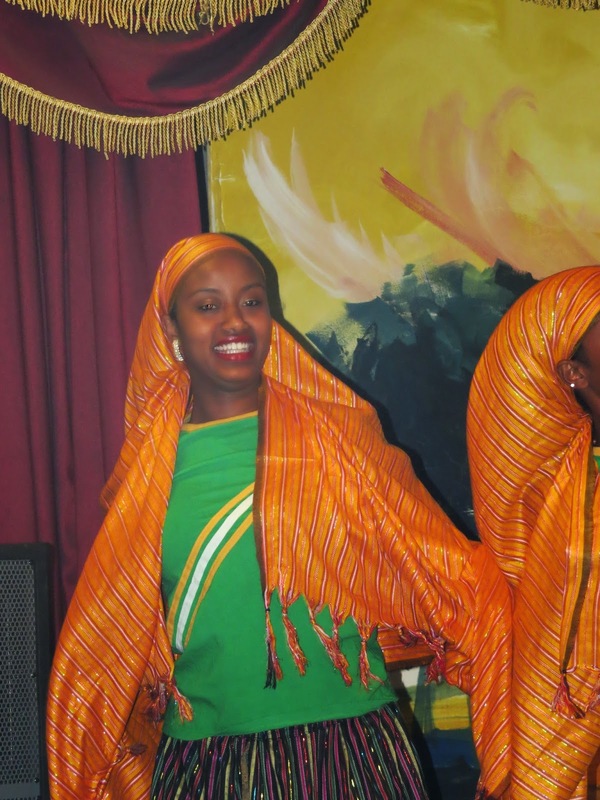 In the US Ethiopia Reads offers a consistent program to help with their fundraising. You can sponsor a book or an entire library. You can attend events, donate and even come to work as a volunteer. I know I enjoyed my visit to a small community library yesterday, where the kids were eager to hear stories. I can’t wait to visit a school library later this week. What I love about traveling to a place I have never been to, is this: it is like taking a blank, new coloring picture. The outlines are there but nothing else. You can color it in any way you like… When I go to a country I have an idea of its outline. But the colors come once I see it for myself. Once I get to meet people, taste food, smell the food, see the scenes – then the outlines takes shape and transform themselves into the real picture. More than 70% of Africa’s mountains are found in Ethiopia. 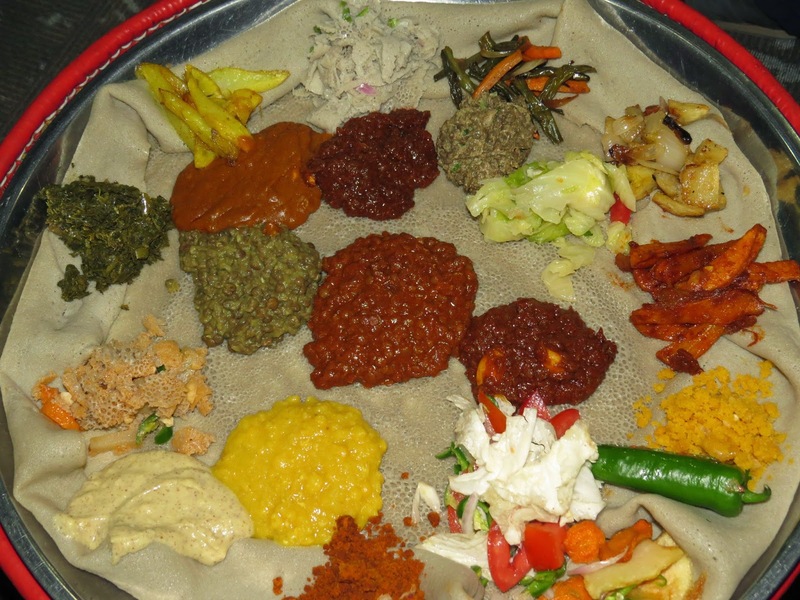 Probably due to the high altitude in the country, Ethiopians are famous for being great long distance runners. Does the name Abebe Bikila ring a bell? He won gold in the 1960 Olympics when running the marathon barefooted. The female coach at school is a former Olympic athlete. Driving along busy roads, past shops made from tin sheets, and broken sidewalks – I see women in long flowing skirts, wrapped in white shawls. I see men wearing a fez, or a baseball cap. Scrawny, dusty dogs try to find food under carts piled high with oranges, tomatoes and bananas. Donkeys wait patiently with loads of cement bags and bricks. Suddenly our driver turns onto a short, dirt road and honks at a gate. A wizened old man with hands like gnarled wood, opens the gate and we park in the shade in a little oasis. Among the cobblestone paths and lush green vegetation are different stone buildings. We have come to Sabahar, a workshop of weavers and spinners that was initiated by a Canadian. Inspired by ancient weaving traditions of Ethiopia, Sabahar creates exquisite scarves, table clothes, blankets and much more using locally produced silk and cotton. 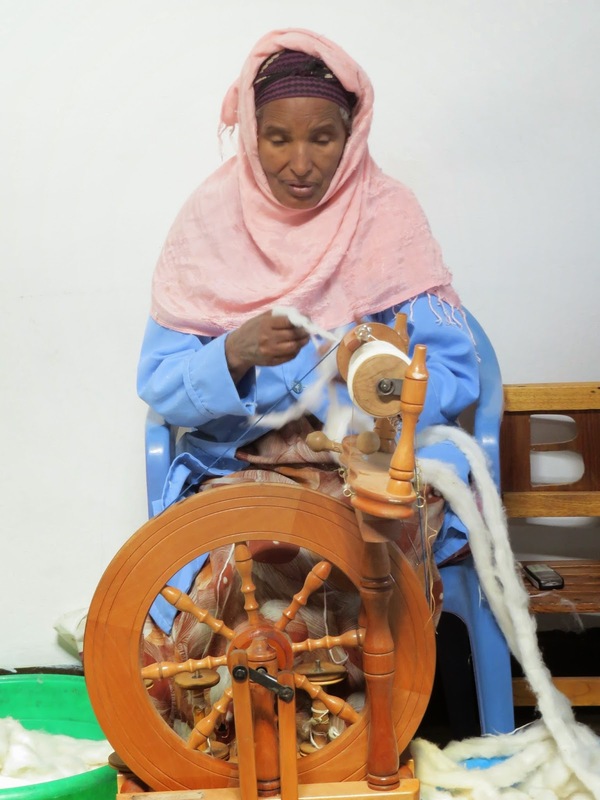 Ethiopian women have been spinning cotton on drop spindles for centuries while men have been weaving fabrics for their traditional clothing as well as the famous Ethiopian ‘gabi’ blankets. The company buys Eri silk cocoons from rural farmers, often women. The Eri silk worm eats castor plants, which are environmentally friendly plants that grow all over Ethiopia. The raising of silk worms is done to supplement income and primarily managed by women. The silk produced by the worms is then hand spun, a craft that has been passed down from mother to daughter for generations. 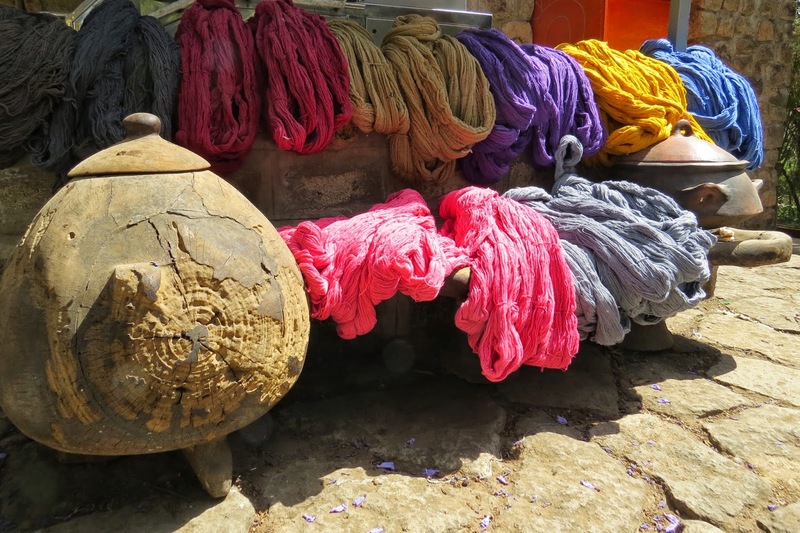 The silk thread is dyed in natural dyes, producing richly colored fabrics. 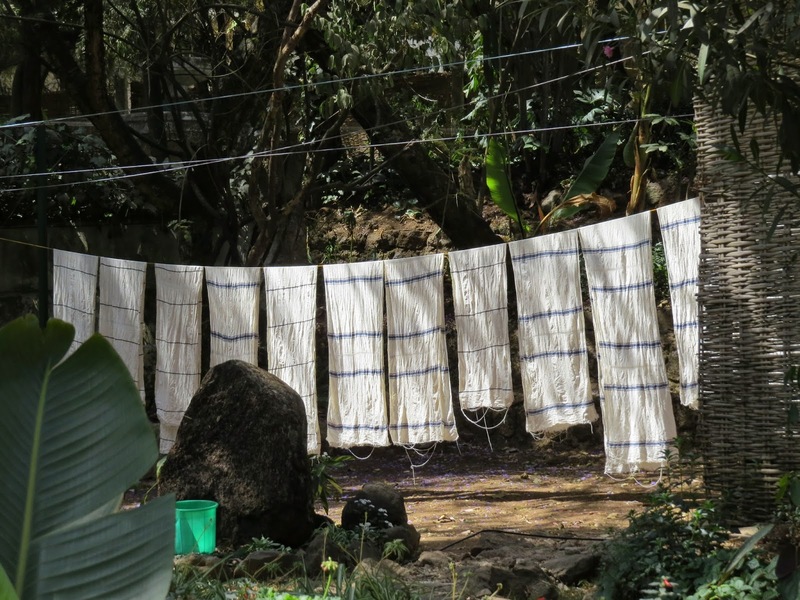 The dyeing process, too, is ancient but often forgotten. 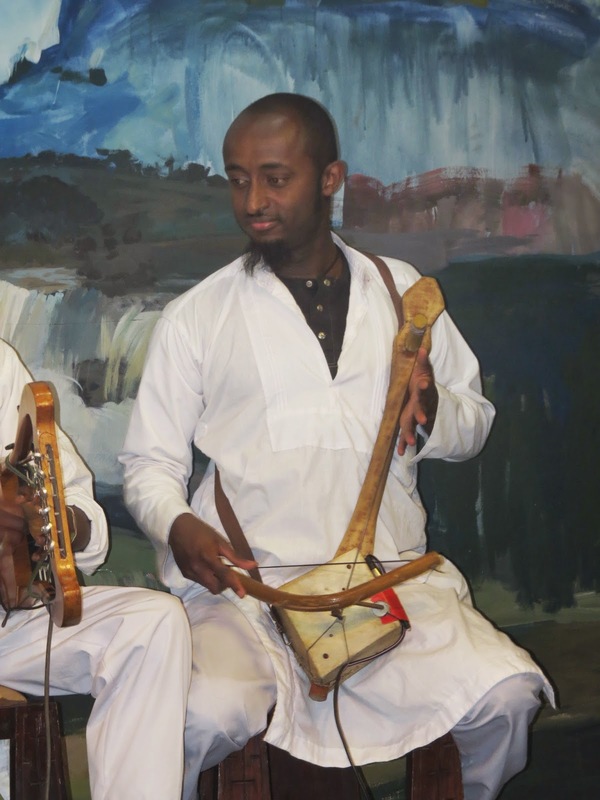 Sabahar helps to preserve these traditional skills. They experiment with flowers, leaves, bark and roots to create gorgeous colours. They even use coffee, tea and flowers to dye the thread. The thread is then woven on traditional looms, in an age-old technique passed down from father to son. I watched as the men skillfully slid the trundle and thread through the silk lines, creating patterns as they moved the loom. Smiles all around as they take pride in their skills and in the final products, that can be bought in a small shop. Sabahar not only helps to preserve traditional skills, they enable artisans to work and receive fair wages. 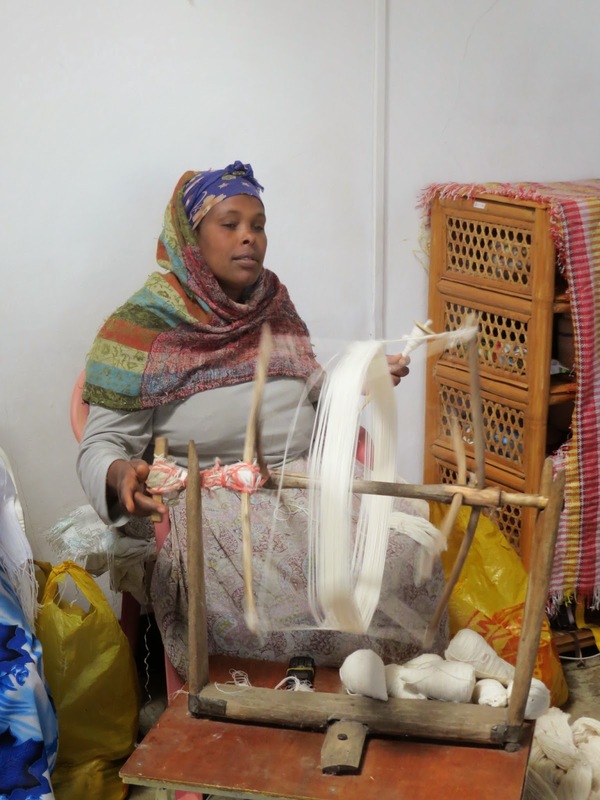 The company employs around fifty people at the workshop I visited but also employs another 100 or so artisans who spin and weave in their own homes or in cooperatives around Addis Ababa. Sabahar emphasizes it philosophy respectful, ethical and sustainable work opportunities for artisans in Ethiopia. If you visit their website you can see where you can buy their gorgeous woven scarves and more, in the US, Canada and in Europe, including a store in Victoria, BC. And, yes, I did buy some weavings! What an experience! We all sat in a large room, adjoined by Ethiopian families with children in all sizes. 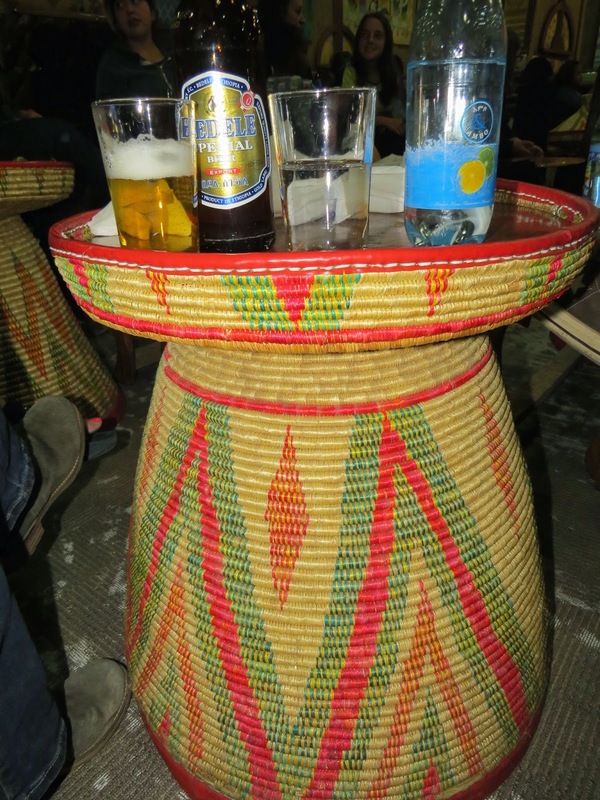 The small tables were like woven baskets with beautiful designs and a round, wooden table top. 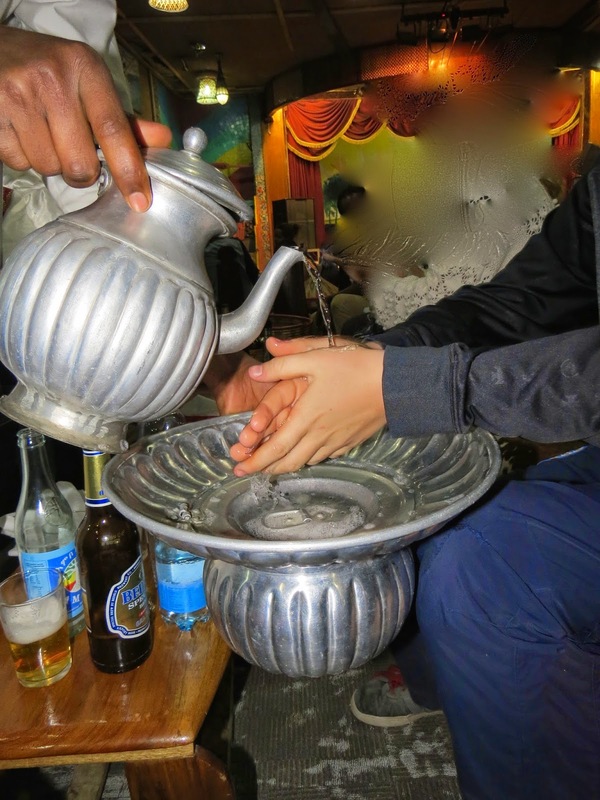 Before eating, a waiter came by with an ingenious tin jug of water, soap and a basin that catches the waste water. He offered this to each of us to wash our hands. An important move since the entire meal is eaten with the right hand. A large round platter of food was placed on each small table – serving 3 or 4 people. 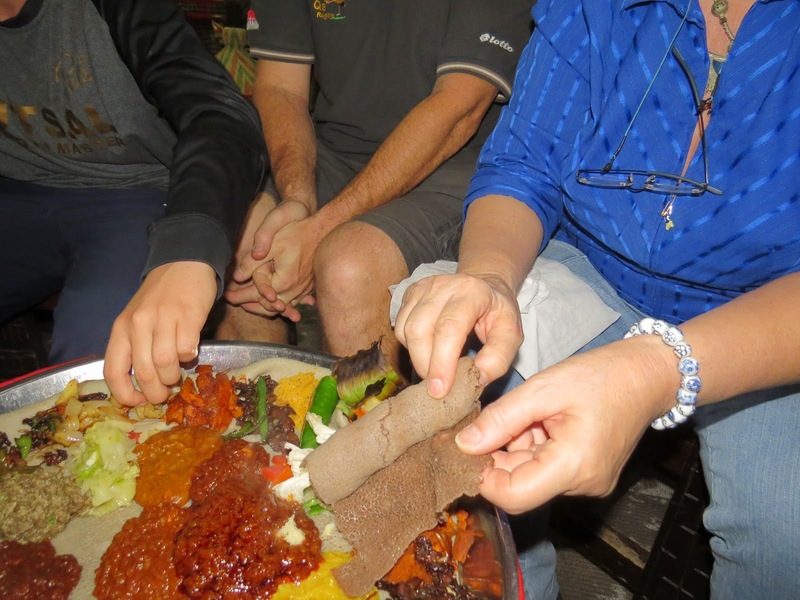 We each received injera, a very thin rolled up ‘bread’ that looks exactly like a tea towel, and is just as soft and pliable. You use your right hand to pull off a piece and then you use the injera to pick up a little bit of food. I think it was filmed in the same restaurant I was at. After eating, we all washed our hands again and were served coffee that was prepared in the same ceremony as I described a few days ago – the beans roasted right there and ground by hand with a pestle. 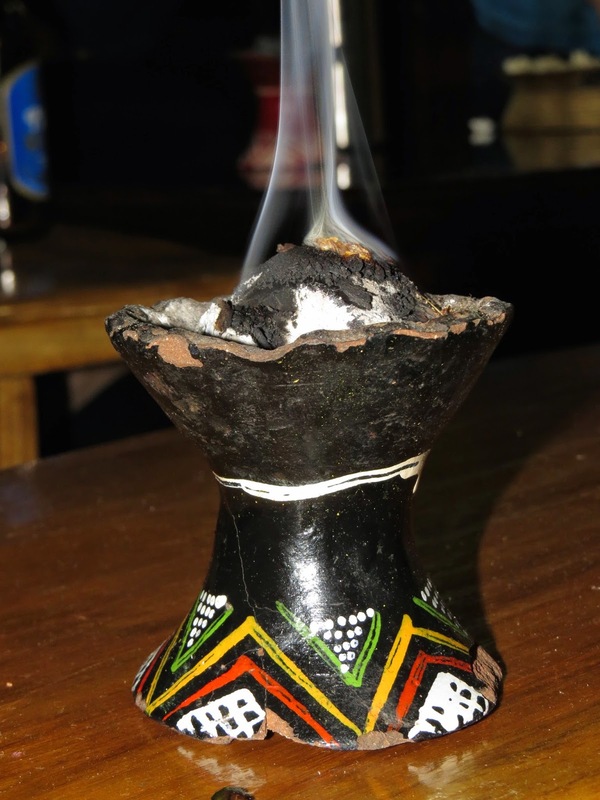 It was served with fresh pop corn and plenty of incense – the smell of coffee mingled with that of the frankincense sprinkled liberally on glowing coals in small stone pots on each table. A fabulous, rich experience. I feel very lucky to be surrounded by kind, smiling Ethiopians and such hospitable hosts here. When we drive through Addis Ababa I don’t have enough eyes to take everything in. It is early morning as we drive through this city of 4 million people. I can spot only one skyscraper but many buildings of 5 or 6 stories – many of them in various stages of construction, showing bamboo scaffolding and unfinished concrete floors. Some buildings have shiny glass and chrome, other seem sad leftovers from a Soviet era. The road is meant to be 2 lane, but cars at least 4 wide try to navigate in the same direction, dodging pedestrians, dogs and piles of gravel. The sidewalks are broken and dusty. Women in clean white shawls scurry along, some with baskets on th eir heads. Children in impeccable clean clothes, carrying backpacks, are on their way to school. Schooling is free here, all the way through highschool. Yet only those who can afford a school uniform can go. Among the more modern buildings, tiny shacks of plywood and corrugated sheet metal lean drunkenly shoulder to shoulder. They look like they were built from a deck of cards and if you move one card, they all might come tumbling down. Men pile tomatoes on wooden wheelbarrows. Shopkeepers squat outside their stores. 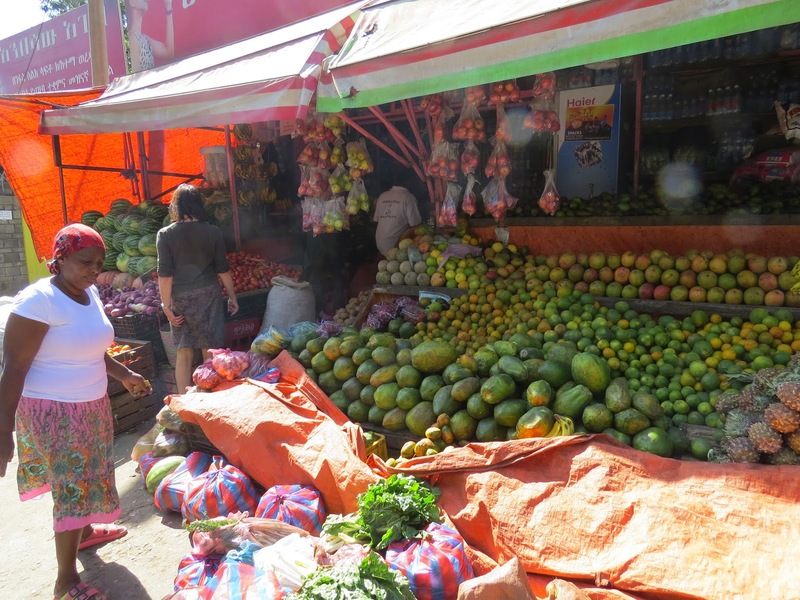 Their products dangles outside the store from roof to floor: plastic baskets, flip flops, shirts, bananas and much, much more. A group of men in crisp, colourful soccer shirts plays a game of soccer. A straight, long queue of people quietly waits for a bus – no pushing or shoving here. A Muslim in long white robes rubs elbows with an Orthodox Ethiopian. Cars of world wide NGO’s push their way along the road, together with beat-up blue taxis, brand new Landcruisers and mopeds. Young men cut boxes, fold open the cardboard and use it to set up their shoe polishing stand. Many people have their shoes polished, here on the dusty streets. One of the most frustrating jobs, I imagine, is that of street sweeper. The women, wearing tall wicker hats, seem to merely be rearranging the dirt with their handmade brooms. But it’s a job. The security guards at stores, banks, hotels and any other building – spend 12 hour shifts sitting on a plastic chair, chatting with passerby’s or reading a newspaper. A salesman carries a large bundle of mops over his shoulder, the wispy white strands of fabric waving as he walks along. I spot 6 large dogs peacefully sleeping on a pile of rubble. I wonder what they did all night. Slowly the sun climbs in the sky and starts to warm the sidewalks. Addis Ababa is awake, although I don’t think it ever slept. Every time again, I am amazed at the things you learn when you travel. For instance, did you know that Ethiopia has its own calendar? And even its own time?! Our western calendar and our manner of counting days, months and years is the Gregorian calendar. It dates back to Pope Gregory XIII in 1582, and features 12 irregular months. Some of our months have 30 days, other 31 and then we had to make up the difference by calling a leap year every four years. Ethiopia, however, did not change to the Gregorian calendar but stayed with the system that was used before: the Julian calendar. The Julian calendar has 12 months of always 30 days, and then one month of 5 or 6 days. Because of this difference, the years add up differently, too. So I am discovering that it is not 2015 here but 2007 or so..
And not only are the days, months and year different, Ethiopians have a different way of keeping time! Confused yet? Add to this a 13 hour flight and an 8 hour time difference with home, and I’m not sure how old I am anymore. 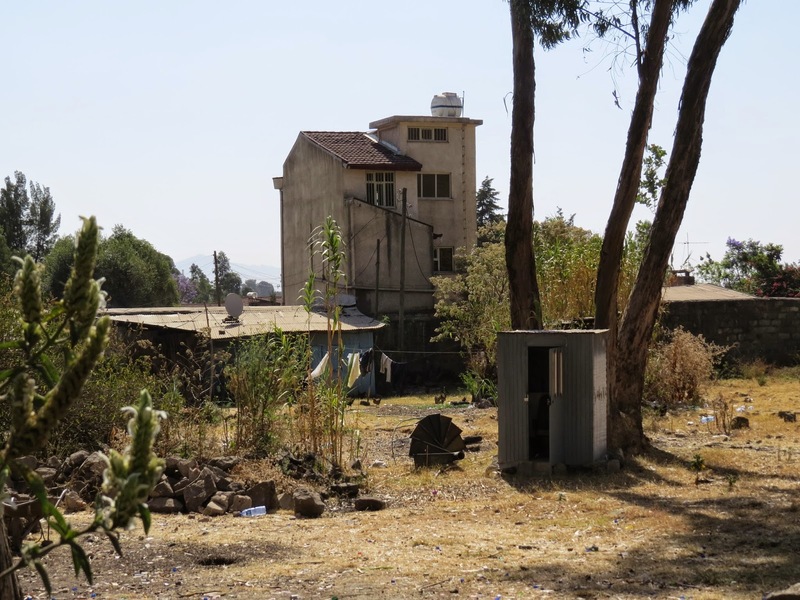 Addis Ababa has 4 million people and is at an elevation of over 2,300 meters. 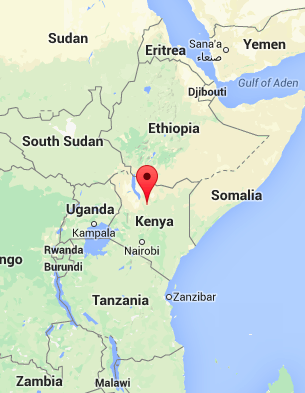 Surrounded by volcanic summits it is on the edge of the Rift Valley where Lucy, the oldest human bones were found. They are now in the museum here. I often wonder who the first person was to discover that something is edible… Like, who was the first soul brave enough to taste blueberries and then wait to see if she would keel over dead? And rice… who figured out to collect those tiny seeds and cook them? Who first stepped on a walnut and then put the mushy insides in his mouth? And corn – would you figure out how to shuck and cook an ear of corn if you had never, ever seen one? Tea, also, is understandable. I can image a Chinese family, sitting around a fire with a pot of water ready to boil. Some dry tea leaves flutter down from the bushes on a breeze. Some land in the pot and, look, they color the water and… hhmm… it doesn’t taste bad. Maybe even better than plain water. Let’s try that again. But coffee? It took a whole series of coincidental accidents to figure that one out! Legend has it that a 9th-century Ethiopian goat-herder by the name of Kaldi, noticed the increased energy of his flock. They didn’t want to sleep and happily jumped around the field. He checked the area and found that they had nibbled on the bright red berries of a certain bush. He chewed on the fruit himself and felt a surge of energy and excitement. This prompted him to bring the berries to a monk in a nearby monastery. But the monk disapproved of the berries and threw them into the fire. A most tantalizing aroma rose from the ashes, causing other monks to rush over and investigate. The roasted beans were quickly raked from the embers, ground up, and dissolved in hot water, yielding the world’s first cup of coffee! The rest, as they say, is history. I haven’t seen any Starbucks here yet, but a popular coffee chain is called Kaldi, after that original shepherd. 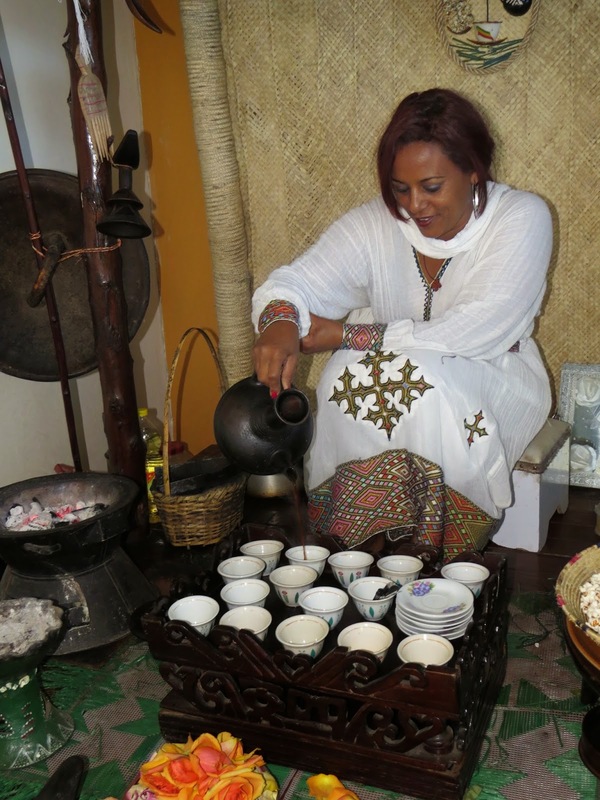 Ethiopia’s coffee ceremony is an important part of their social and cultural life. 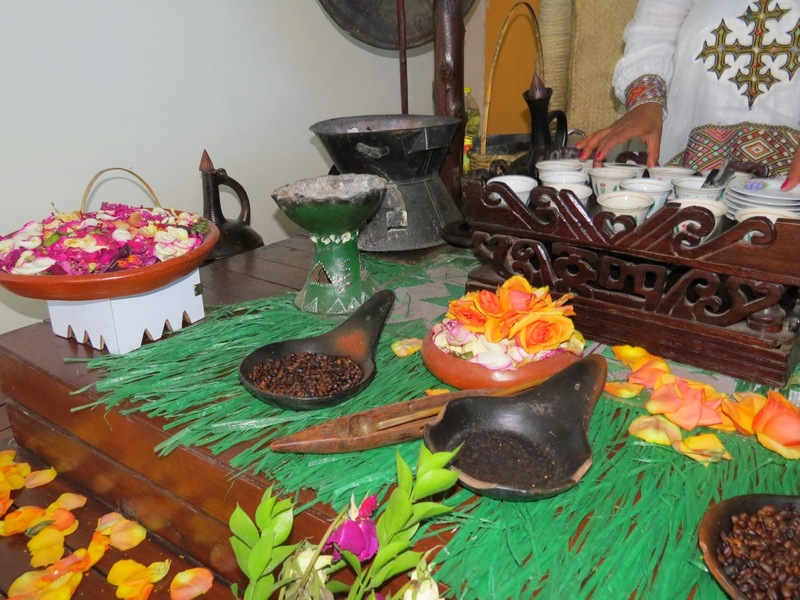 When I first spotted the ceremonial area where coffee is brewed, I took it to be a religious altar. 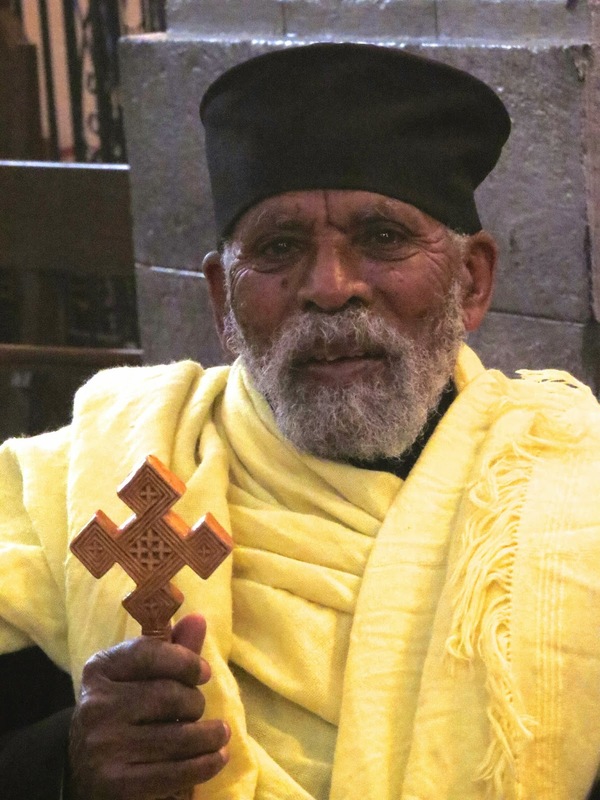 And I guess, in a way, drinking coffee in Ethiopia is a bit of a religious experience. The ceremony is usually conducted by a young woman, dressed in the traditional Ethiopian costume of a white dress with coloured woven borders. The long, involved process starts with the ceremonial apparatus being arranged upon a bed of long scented grasses (or plastic artificial grass indoors). The roasting of the coffee beans is done in a flat pan over a tiny charcoal stove. This is how it is done even in the lobby of the small hotel where’s staying… The strong smell mixes with that of incense which is also burned during the ceremony. The lady washes the coffee beans on the heated pan and stirs it, shaking away the husks. When the coffee beans have turned black, they are ground with a pestle and mortar. The ground coffee is stirred into a black clay coffee pot locally known as ‘jebena’. The lady finally serves the coffee in tiny china cups to those who have waited and watched the procedure for the past half-hour. Pouring a thin stream of coffee into each little cup from a height of one foot without an interruption apparently requires years of practice. You then drink the coffee with plenty of sugar but no milk. It is also tradition to eat fresh popcorn with your coffee. 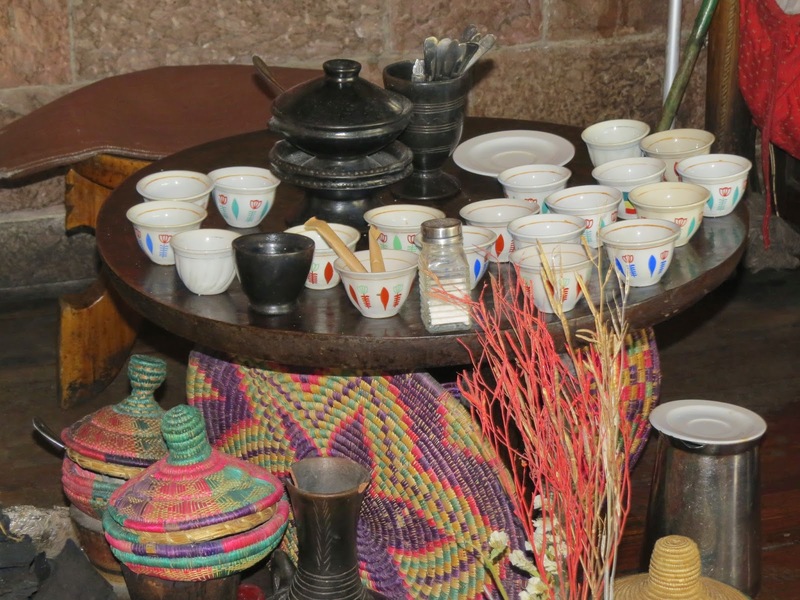 In parts of Ethiopia, the coffee ceremony takes place three times a day – in the morning, at noon and in the evening. It is the main social event in the village and a time to discuss the community, politics and life in general. You must have at least three cups, as the third round is considered to bestow a blessing. And, I must say, its flavor is heavenly and smooth without the acid taste so often found in coffee elsewhere. I’m told the full ceremony can take three hours, so never complain again if your workers want a 15 minute coffee break!